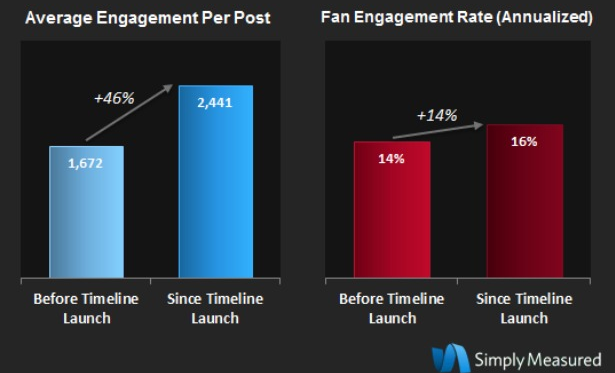 With brands under the gun to revamp and adjust their Facebook strategy before the March 30 date when all pages will be ported onto Timeline, word is that the new Timeline set-up is boosting user engagement by 46%. A study out Tuesday on the three-week-old opportunity to shift brand pages to the new Facebook Time, conducted by Simply Measured, has reduced the fears that many companies had about changing their social networking pages. The study found that when it looked at the user engagement of 15 brand pages, the shift from the old Facebook layout to the new Timeline structure resulted in a jump in various types of user engagement. 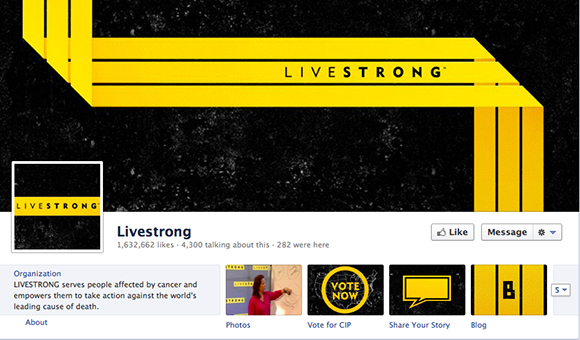 Some companies, such as Livestrong and Toyota experienced a 161% and 156% pop in engagement, respectively. Marketers have been expressing concern the last few months about the new Timeline structure and making the switch over since contests, games and other apps would be impacted by the change. Timeline was always designed to help increase engagement and provide a more district voice and history to companies that want to layer in video, audio, pictures and other elements for their followers — and it appears to be doing just that. Facebook said the transition to Timeline is going well, and more than 8 million brands, nonprofits and companies having already switched their pages to the new format. A closer look at the study data shows that the number of responses and comments on the brand pages actually dropped with the new Timeline set-up but the number of people viewing multimedia shot up more than 65%. One theory is that the larger images on Timeline encourage more people to view and interact with those elements than reply or share a post. 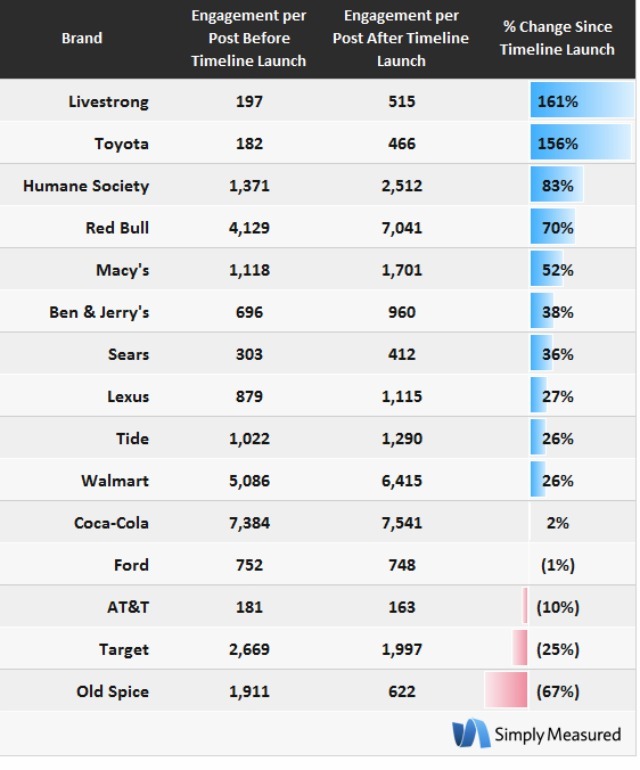 Within the 15 brands studied, Livestrong, Toyota, Humane Society, and Red Bull showed the largest percentage increase in engagement, and, especially a sizable lift in per post averages. One key focus that Facebook Timeline has is that it pushes relevant and compelling information to the people that would be most interested in that content. 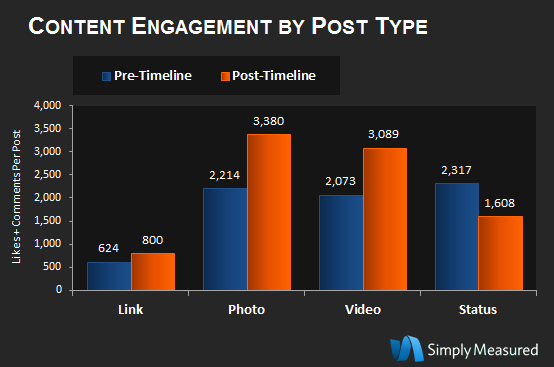 And one of the most surprising findings was that even if a company has not posted in more than a week, content that was featured still attracted new engagement (from viewing to sharing to commenting.) So somehow, the layout is giving these brand pages a fresher feel and a livelier look to encourage fans to interact. Just two months ago, Twitter started rejiggering the brand pages and availability of new features for big spenders on its site so that the companies could have more flexibility in their layout and design. While Twitter introduced a limited selection of brand pages in December, which 20+ companies got invitations to start, Feb.1 could mark the day that more companies roll out brand pages and new functions as long as they’ve already committed $25,000, according to AdAge. Currently, the brand pages have been designated to the big global companies that already spend a lot of cash on advertising and promoted tweet on the site, such as Nike, Coca-Cola, Disney Pixar and HP. These brand pages have allowed companies to customize the landing page for their central Twitter handle and feature certain content on the top of the page, while making other Twitter correspondences lower on the page — so that no matter how often the company tweets (or people tweet at it) a video clip or promoted item will remain on the top of the page. While the existing Page APIs will remain intact, Facebook has created a new admin panel and Activity Log lets Pages see a quick view of their Insights data, respond to inbound private messages, and feature, hide, or delete posts. This change will be most beneficial for brands lengthy, detailed histories where they can add milestones and photos throughout the past. This is the first time that the companies can coherently reference company events that preceded Facebook and add video, comments and other interactive elements that followers that learn from. Marketers have reasons to be both excited by the story-telling but also could be upset because the current Timeline set-up reduces the prominence of apps which could hurt companies that have turned to gamification for more customer feedback and interaction. Under the Timeline layout, pages can no longer display their custom applications as their default landing tab like they could prior. This was a powerful marketing feature where brands would introduce their company with access to an app that teased special content like contests or coupons. Without the default landing tabs, users don’t have to “like” a page in order to access some of the major content and marketers could lose the number of email signups, contest entries, and other key performance indicators. But this all could change once Facebook gets sufficient feedback from brands on how to weave in the apps and gamification elements without sacrificing the Timeline aesthetic.